The world famous Confucian Temple or Nanjing Fuzimiao is now a major tourist and cultural entertainment centre in the province of Jiangsu. 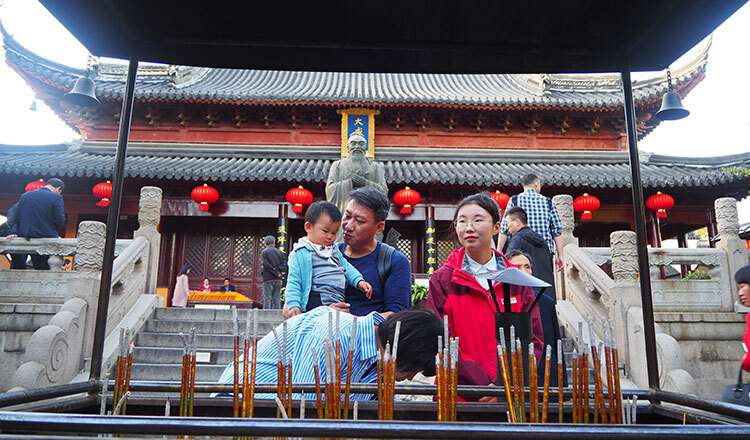 Rather than being a place of quiet reflection and study, the area has become a tourist magnet, complete with a giant urn to place equally large joss sticks, striking a gong for 2 yuan and amulets, all giving a resemblance that the temple has become overly commercialised. Built by the side of the Qinhuai River, the Confucius Temple is not just a temple. Confucius was a great educator in ancient China and his ideas on education continue to influence Chinese society. Even now Chinese students recite well-known articles and sayings from Confucius. There is also an old preserved building where scholars took their imperial examinations. The Confucius Temple consists of a cluster of neatly constructed and preserved buildings which covers an area of over 26,000 square metres. The temple is reminiscent of both Ming and Qing dynasty architectures. It was founded in 1034. In ancient times, it was a site where people could make sacrifices to Confucius, said to be China’s most revered ideologist. The temple also served as a marketplace for merchants as well as a centre where culture and arts thrived. In 1985, the municipal authorities renovated the temple, effectively commercialising it. A series of tourist shops, snack bars, restaurants and hotels set up shop there with the goal of expressing a combination of traditional and modern beauty at the temple. There are many places of historical interest within the Confucius Temple, such as Jiangnan Gongyuan and Wuyi Xiang. Jiangnan Gongyuan was the largest imperial examination centre in ancient China. Constructed during the Song dynasty, potential government officials were examined and selected here. Wuyi Xiang, or “Black Clothes Lane”, was named after the Wu soldiers, who wore black uniforms. During the Jin dynasty, Wuyi Xiang became the residence of Minister Wang Dao, followed by Minister Xie An, and finally a few of Nanjing’s noble families. Nanjing itself is reputedly one of the most charming cities in China, big and full of tradition with very expensive real estate, prized at almost $9,000 per square metre. Considered by many to be more of a college town, Nanjing maintains is deep Chinese roots, while still managing to modernise at a much faster pace that other parts of China. Another one of the historical capitals of China during the KMT/Nationalist, Nanjing has lots of interesting cultural attractions. However, the largest and oldest Temple of Confucius is found in Confucius’ hometown, present-day Qufu in Shandong Province. It was established in 479 BC, one year after Confucius’s death, at the order of the ruler of the State of Lu, who commanded that the Confucian residence should be used to worship and offer sacrifice to Confucius.